There are no borders in bonsai. The dove of peace flies to palace as to humble house, to young as to old, to rich and poor. So does the spirit of bonsai. Weeping willows are perhaps some of the most beautiful bonsai subjects—they are also among the most challenging, if not occasionally tedious species to maintain. However, those with the expertise and patience required by these cultivars of the Salix genus will find a rewarding and deeply satisfying bonsai experience. While there is no “right” way to begin the practice of bonsai cultivation, it’s probably reasonable to say that the weeping willow is not an ideal choice for beginners. Intermediate to advanced level bonsai enthusiasts will likely have the most success raising one of these sweeping, elegant trees. 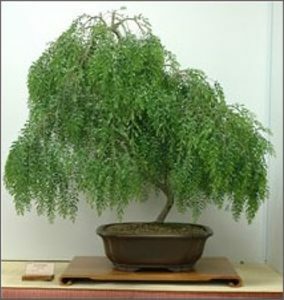 This is because a weeping willow bonsai requires a bit more care and maintenance compared to other species—for example, its watering requirements are quite stringent, it will need to be pruned regularly due to its rapid growth, and experience with wire shaping may be necessary depending upon the desired style. Interesting facts about the weeping willow in nature, history, and as a bonsai. Which styles and forms are ideal for weeping willow bonsai. How to conduct proper care and maintenance for this demanding species, including watering recommendations, pruning suggestions, the best times to repot, and more. Hazards for which the weeping willow is particularly vulnerable, and how to correct or prevent them. The weeping willow, or Salix babylonica, is native to northern China, but has been successfully cultivated across the world. In nature, this deciduous tree grows rapidly, and can exceed 80 feet in height. Compared to other species of tree it is quite short lived, with an average lifespan ranging between four and seven decades. As bonsai, this lifespan is usually even shorter, spanning approximately 25 years. Its leaves are generally light green and droop in spiral arrangements, and in early spring the tree will produce yellow, catkin-type flowers. Salix babylonica has a rich and interesting history. Admired for its beauty, it was traded as an ornamental tree along the Silk Road, from China throughout the Middle East and eventually to Europe. The tree is known for its symbolism of grief—at one point in history it was even used as the primary fuel for torches used in funerals, and the oracles of the time claimed that it was an omen which predicted the death of Alexander the Great, as a weeping willow is said to have swept across his head as he crossed the Euphrates. It is worth noting that babylonica in this species’ name is actually a mistake—the tree’s origin lies wholly in China, not Babylon. Carl Linnaeus, the Swedish botanist who formalized binomial nomenclature, mistakenly translated a verse in the Bible which he thought described the weeping willow as having been present in Babylon (the trees described therein were likely poplars, which to Linnaeus’ credit are in the willow family). As bonsai, the weeping willow is quite temperamental but is an excellent subject for some of the most visually stunning examples of the formal and informal upright, cascade, or semi-cascade shaping styles. Owners must be prepared to provide their weeping willow bonsai with extra care and attention, as it has a variety of specific maintenance needs and grows very quickly—fully grown weeping willow bonsai will likely reach a foot in height. Bonsai practitioners who train their weeping willows in this arrangement are generally seeking to forgo the tree’s natural inclination to lean and droop, instead shaping it in an upward fashion. Unlike some other species of tree, this is quite possible with a weeping willow bonsai on account of its responsiveness to shaping. This can make for a very interesting look, as the leaves will still hang downwards quite readily. As with other species, the trunk generally takes on an ‘S’ shape, but branching may not occur until further up the trunk, rather than at each turn. This is perhaps among the most popular style for weeping willow bonsai. The tree’s natural slanting state similarly mirrors the weathered, beaten look of the informal upright style, which seeks to emulate a tree which has been toughened by natural causes such as weather, insects, or animals. The tree will bend slightly to the front, which for weeping willows can give the appearance of motion because of their long, hanging leaves. The hanging nature of a weeping willow’s leaves lends itself quite nicely to the cascade pattern, in which the bonsai is shaped so that the trunk grows upward, bends, and then points downward in an upside down ‘U’ shape. If sparingly pruned, the leaves of a weeping willow can extend the length that a cascade-style bonsai traditionally hangs downward. The branches should be allowed to grow horizontally, which will promote balance and can give the bonsai an appearance of being larger—again, thanks to the leaves. Similar to the cascade style, weeping willows can be shaped to the semi-cascade style to elegantly display their long leaves. In this style, the trunk of the tree has been shaped to grow upwards a short distance, and then—instead of pointing straight downward to the bottom of the pot—points out to the side, generally stopping at soil-level with the container. Weeping willow bonsai shaped in this style may have their leaves hang down to be level with the bottom of the container (but again, not the trunk or branches themselves). You may find that this is an aesthetically pleasing way to display the leaves of the tree. Training, maintaining, and caring for your weeping willow bonsai can at times be a challenge, but multiple rewards will be found by patient and dedicated bonsai enthusiasts who provide this tree with the proper amount of attention. Beauty aside, you’ll find that the root system will conform rather easily to your pots, the trunk will likely be strong and thick, and weeping willow branches are—with an experienced touch—easier than some other species to keep balanced. There are many variations of the Salix genus, and while the information here generally concerns the needs of Salix babylonica, the vast majority of sub-species will respond positively to these conditions and recommendations. Where you choose to display your weeping willow bonsai is largely dependent upon the weather conditions of where you live. This tree thrives in warmer climates, generally from 75 degrees Fahrenheit up to 95 degrees Fahrenheit (approximately 25-35 degrees Celsius). If these temperatures are in line with your usual spring and summer weather, storing your bonsai outdoors is not only perfectly fine, but in many cases recommended. Note that this temperature range is ideal, a weeping willow can survive outside these margins as long as it isn’t too much or for too extended a duration. In the winter, particularly if you expect freezing temperatures, bringing your weeping willow bonsai indoors is recommended to prevent damage to the root system. However, keep in mind that the warm, dry conditions of the indoors will likely cause the tree to require more water, so you may have to increase the frequency of your watering schedule. Full sunlight is the ideal lighting condition for a weeping willow in most cases. If it is very warm during the middle of summer, move the bonsai to a position where it can receive some shade so that it doesn’t get completely dried out or experience leaf burn. As you’re probably beginning to see, the “name of the game” with weeping willow bonsai is proper moisture management. If you are uncertain, ensuring that the soil and roots are continually damp will yield best results—a moisture meter may help. Unlike other bonsai which benefit from a lot of drainage, weeping willows require acidic soil which is superior at retaining water. Finding a balance between water retention and some drainage (to prevent root rot) is necessary. This can be accomplished by potting your bonsai with red Akadama. This type of soil also offers the secondary benefit of slowing the rapid growth of a weeping willow. A popular soil mixture for ideal weeping willow bonsai health is red Akadama with fine gravel (sometimes called grit) and peat moss. This combination will allow for the right degree of water retention, without going overboard—the Akadama and peat moss will hold water in, while the gravel will allow for enough drainage. Weeping willow bonsai respond well to traditional fertilization as well as foliar fertilization (spraying a liquid fertilizer upon the leaves and branches). The fertilizer used within the soil should be water-soluble and contain potash (potassium), phosphoric acid, and low levels of nitrogen. These three components and their amounts will be listed on the back of any decent fertilizer packaging. Generally speaking, an equal ratio fertilizer will be fine—this will likely be referred to as a “20/20/20” mixture, meaning that there’s an equal amount of potash, phosphoric acid, and nitrogen. The organic matter in the fertilizer should promote this balance, and steer manure is common. Fertilization, or feeding, should be conducted once monthly at half-strength during both spring and summer. Watering your weeping willow bonsai properly is of the utmost importance to promote growth and overall health. In the wild, weeping willows are often the healthiest when growing near rivers, swamps, or other environments where the root system is provided with constant water. This tree is “thirsty” and requires more water than many other species of bonsai, so be prepared to water it twice daily on average, especially if it is receiving direct sunlight for the majority of the day (10 hours or more). As you learn the moisture requirements of your weeping willow, it is perfectly acceptable to provide it with small amounts of water throughout the day, applied to the soil and sprayed upon the leaves. As a general rule of thumb, if the soil becomes hard or dry to the touch, apply water—do not allow it to dry out, but don’t overdo it. Finding this balance and developing an ideal watering schedule can be significantly easier with the use of a moisture meter, but in most cases err on the side of more moisture rather than less. If you’ve followed the above recommendations for the soil mixture, your pot should be achieving the right ratio of retention vs. drainage. The roots themselves should not be directly resting in water, but many weeping willow bonsai owners—particularly those in warmer climates—will find that the tree thrives if the pot is placed in a shallow tray of water (more details on this in the next section). Weeping willow bonsai grow quickly, especially when they’re young. The initial container should allow for enough room that the roots fill less than half of the pot, and repotting should take place once the root system exceeds this amount. How often repotting must take place is largely dependent upon the size and age of the tree. In some cases, this may be as frequently as twice a year, but in general once every two years will be appropriate. Repotting is ideally conducted just before or at the very start of spring, just before the weeping willow begins to bud. It’s important to repot a weeping willow bonsai when the roots begin to overtake half or more of the pot because they’re relatively sensitive and grow quickly. Compacted roots will cause the tree to suffer and potentially die since this will reduce the available amount of nutrients and, for a weeping willow, its all-important source of water. During summer, place the pot in a tray filled with a small amount of water. This will ensure that the soil can absorb enough moisture, and may even serve as a fail-safe in the event a watering session is missed. Note that this is intended to provide water to the soil, not the roots—a common mistake made by novice weeping willow bonsai owners is to have the roots making direct contact with the soil, but of course this would betray the previous recommendation of not allowing the roots to take up more than half of the pot. Weeping willows grow rapidly and thus must be pruned regularly not only for its health, but to maintain the desired style or shape. To prevent the branches and leaves from becoming too dense—a distinct possibility with this species—a trimming session just before the growth season of spring begins is a good idea. You can feel free to trim as much as two thirds of the growth on the tree at this time, as it will grow back quickly and this can help you maintain the shape of the bonsai. During the spring, it’s very likely that you’ll need to consistently clip or pinch off new growth from the branches to prevent overgrowth. However, during other seasons, you’ll likely want to allow new shoots to grow freely. Instead, focus your trimming efforts on older branches. Other than for these maintenance purposes, the amount of pruning which should take place is likely to be determined by the style of bonsai which the tree is being trained in. If you’re allowing the leaves to hang (or “weep”) naturally, do not hesitate to cut branches almost completely back to the trunk during winter—they’ll be back soon enough. To maintain the shape of your desired style, weeping willows may be wired. Take care not to wire too tightly, because weeping willow bark isn’t quite as hardy as some other species. Whereas for some bonsai you can simply wire and forget, you’ll want to adjust the wiring strength on a weeping willow more frequently. In most cases, looser wiring is better, as this will prevent wire scarring. The tightness of the wires should be adjusted as necessary—loose enough to avoid scarring, but tight enough to inspire growth in the desired direction. Weeping willow bonsai are vulnerable to common pests, especially if positioned outdoors. However, these sensitive trees are generally more at risk of disease or infection. With proper maintenance, both of these issues can be avoided with relative ease. Common seasonal insects may attempt to infest your weeping willow bonsai, especially if kept outside. The usual culprits are aphids, spider mites, and mealybugs. The shape and composition of weeping willow leaves can make pests difficult to spot, so regularly inspect the leaves of your bonsai. A once-weekly “insect check” can help you to discover unwanted guests before they have time to do any substantial damage. Aphids will almost always be found in groups along the underside of a weeping willow’s leaves. Thus, during your inspections, be sure to look at both the top and bottom of the leaves. These pear-shaped insects will appear in clusters and can cause additional infections or promote mold growth, so deal with them as quickly as you can. Mealybugs are thankfully easier to spot than aphids. These common bonsai pests are a grayish color and significantly larger. However do not underestimate them—mealybugs can lay eggs, the sacs of which are quite a bit more difficult to identify. Spider mites love to gather on weeping willow leaves, and will consume them rather quickly if left unchecked. They can be identified as tiny, continuously moving red or brown insects which cause patterns that look like spiderwebs. Weeping willows grow plenty of leaves, so an infestation can travel quickly. You may find leaves falling off and gathering at the bottom of the container. These fallen leaves are still likely infected and must be completely removed. To prevent or remove these pests, an organic insecticide diluted to half strength should be regularly applied to your bonsai. Weeping willows are sensitive trees, and thus strong soap solutions should be avoided unless as a last resort. An organic insecticide from your local garden store is safe to use. While spraying, take care to make sure that the solution reaches the undersides of the leaves as well, and avoid spraying directly onto the soil, especially if it isn’t moist (which, in the case of a weeping willow, it should be at almost all times). To prevent or cure diseases, follow the same instructions as you would to remove insects and pests. Generally speaking, you’ll also have to prune off any affected areas—this may result in a visually unappealing bonsai until healing can take place, but it can save an infected tree. One of the benefits of a weeping willow bonsai is how quickly it grows, so cut out infected areas liberally. A quick note on willow scale: If you’ve heard of this common problem for willows and are concerned that it may become a problem for your bonsai, understand that it is not technically a disease—in this case, “scale” refers to insects like the mealybugs described above and should be dealt with accordingly. As weeping willows require so much moisture, they are more susceptible to mold, mildew, and root rot than other species. These problems can almost always be avoided by not over-watering this species of bonsai. While this is sometimes difficult to gauge since weeping willows require so much water, make sure that the roots are not directly in water and that your pot has proper drainage. This is another scenario where a moisture meter can come in handy. You’ll also want to keep an eye out for rust. Rust is a fungal disease which causes small bumps to appear on the underside of weeping willow leaves. These small bumps or “dots” are usually yellow, red, or brown, and will have a raised texture. The good news is that rust is usually not fatal to a bonsai, but can be the source of major damage—remove affected areas and use an organic fungicide to protect the rest of your tree. As with mold prevention, moving your bonsai to an area with good airflow or breezes can avoid rust from occurring or reoccurring. If for you bonsai is representative of patience, balance, and growth, a weeping willow can be the perfect manifestation of these qualities. These elegant trees require precision in their care and maintenance—only add one to your collection if you have the time and experience necessary to allow it to thrive. Novice bonsai practitioners may be attracted to a weeping willow for its beauty, but may be doing themselves a favor by starting with a tree that requires less meticulous care. Excellent alternatives are juniper, ficus, jade, or a member of the Ligustrum family. However, if this is a challenge you’re ready for, caring for a weeping willow bonsai is immensely satisfying.